TDK-Lambda Series HWS are industrial grade single output power supplies available from Kepco in 300W, 600W, 1000W and 1500W sizes. These models are UL 508 approved and Semi F47 Compliant (high line a-c) and feature small size, high efficiency, Universal input (85-265V a-c), and a Limited lifetime warranty. All sizes feature nominal voltages of 3.3V, 5V, 12V, 15V, 24V, 48V. The 1000W and 1500W series also have 6V, 7.5V, 36V and 60V models as well. The 1000W and 1500W sizes allow remote programming by voltage; this feature is an option (/PV) on the 300W and 600W sizes. 300W, 600W: /PV Remote Programming: Fast delivery option contact Kepco. Optional DIN Rail mounting is now available for 300W, 600W, 1000W and 1500W HWS models. 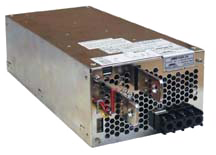 Kepco offers full service power solutions, including other add-ons such as mounting brackets, special harnesses and cabling, as well as packaging a mix of power supplies into a single multi-output power assembly. Contact Kepco for more information. Optional Remotely Programmable Output (/PV) for 300W, 600W models with fast delivery available.